Some people find the common black-on-white text hard to read, and prefer off-white colours. ClaroView can provide a coloured overlay for the whole screen so everything is tinted and easier to read. You can choose any colour you like and change colour and intensity depending on the time of day, the light conditions and what you find best. ClaroView PC is included in ScreenRuler and ClaroRead. 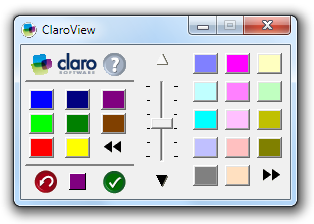 What’s new in the latest version of ClaroView.